Pearl Seas Cruises offers small-ship itineraries to the Great Lakes, the Canadian Maritimes, St. Lawrence Seaway, New England and Cuba. Launched in 2014, the line's first ship, Pearl Mist, is a 210-passenger, small, fully stabilized, all-balcony cruise ship which is registered in the Marshall Islands. The Line’s corporate headquarters is in Guilford, Connecticut; it's a sister company to American Cruise Lines. Pearl Seas Cruises draws mostly iNorth American cruisers looking for small-ship experiences relatively close to home; flighs to and from its cruises are relatively short for its passengers, with departures from Maine, Chicago, Toronto, and Quebec. The line’s Cuba itinerary departs from Ft. Lauderdale, Florida and is one of the only Cuba cruises that fully circumnavigates the island. Lively cocktail and meal-time conversations with new friends are an integral aspect of the Pearl Mist experience, and its small size means you quickly get to know almost everyone. Onboard, passengers will find five-star service from well-trained crewmembers, and gourmet dining that's flexible enough to accommodate all special dietary needs. The line also offers onboard evening entertainment and daily lectures and presentations given by destination experts highlighting the itineraries and regions traveled. Pearl Seas’ cruises are semi-inclusive; all meals are included, and beer and wine are complimentary with both lunch and dinner service. As well, cocktails, beer, wine and spirits are complimentary each evening during the 5:30 p.m. cocktail hour. Evening entertainment and onboard enrichment is included. Shore excursions on its Cuba sailing are complimentary. With a capacity of 210 passengers, intimacy is the name of the game on Pearl Mist. Dining is open seating, so unless you stick to one table all the time, you can quickly get to know all your shipmates during mealtimes. The dining atmosphere is congenial and friendly. No reservations are ever required so there is no waiting for a table or to be served. Cabins are very spacious and all but one room on the ship have private furnished balconies. The cabins on the upper two decks have floor-to-ceiling sliding glass balcony doors so you can sit on your bed and watch the scenery glide by. The ship features 12 single-occupancy cabins, a rarity in cruising and great for solo travelers. Pearl Mist has five categories of regular cabins and suites, ranging from 275 to 580 square feet. All are equipped with Wi-Fi Internet access, flat-screen TVs, DVD players and Keurig coffee machines. Cabins can be configured with 2 twin beds or one king bed. Pearl Mist has 5 decks with elevator access to all stateroom decks, making the ship convenient and easily accessible for those with mobility issues. The lifestyle onboard Pearl Mist is slow. Daily naps are not an uncommon part of a day's schedule, and the nighttime fun is pretty much done by 10 p.m. The line does provide onboard entertainment each evening in the ship’s spacious lounges, along with the daily enrichment lectures highlighting the next day’s port-of-call. The limited onboard activities available can be problematic for some people, but most guests relish the peaceful atmosphere aboard the small ship. As well, most Pearl Seas cruises are itinerary-focused and port-intensive with a stop every day, so there's always a chance to get off the ship and enjoy guided shore excursions and the many other local attractions. Small coastal and river ships are generally the province of the comfortably mature and curious. Expect a blend of middle-aged and older folks, educated, friendly, and well-traveled. Guests are mostly from the United States and Canada. Launched in 2014, Pearl Mist is the first ship in the line's planned fleet, with more ships to come. Pearl Mist carries 210 passengers, has 5 decks including a top sundeck, and 108 staterooms (all but one with private furnished balconies). The ship has a grand dining room, several spacious lounges (both inside and outside), an exercise area, and library. The ship features modern technology with full stabilization, communication, and engineering equipment. Pearl Mist is a diesel-powered, shallow-draft vessel, giving it speed between ports and stops, as well as the ability to enter both small and large locales with equal ease. 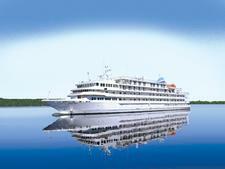 Pearl Mist divides its time between the Great Lakes, Canadian Maritimes, New England and Cuba.